Are you freely able to move about your metro Atlanta or north Georgia home today, as easily as you were able to, years ago? For many 55+ and senior homeowners in Fulton, Gwinnett, DeKalb and Cobb County homes, it has become difficult to navigate stairs and bathrooms due to aging or due to a disabling illness. 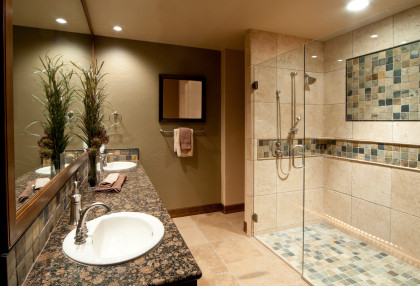 Let’s consider some aging in place bathroom design tips as solutions! Most bathrooms in the home today do not have aging in place bathroom design features; rather, they are equipped with the standard height toilet, a vanity with cabinets underneath, the traditional bathtub with side wall and a shower stall that has a raised curb. While these may have been very easy to access and convenient for many years, they now often present an accessibility obstacle for the 55+ senior, or an individual with a disability or illness. Aging in place bathroom design remodeling projects now being done in Fulton, Gwinnett, DeKalb and Cobb County homes normally includes a 60-inch wheelchair or scooter turning radius, grab bars, a roll under vanity, a walk in tub or roll-in shower, accessible pull-out storage to provide accessibility and safety for the homeowner. Are you wondering how to incorporate some aesthetically pleasing designs into your projects? If so, the NAHB Aging-In-Place Design Checklist might be suited to your needs. 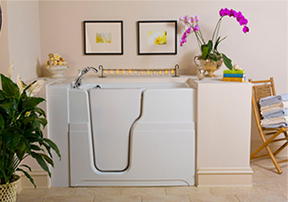 Atlanta Home Modifications offers aging in place bathroom design tips to help you make your home more accessible as you age, or in the event you are struggling with an illness or progressive disease that has impaired your mobility. Whether you live in Fulton, Gwinnett, DeKalb or Cobb County, our design consultant is available to visit your home to perform an in home assessment to offer aging in place bathroom design tips and strategies. Preventative measures to help 50+ seniors and elderly Atlanta residents stay safe include home modifications such as wheelchair ramps for homes, straight and curved stair lifts, and roll-in shower and walk-in bath installations. Call us today at 770-880-3405 or contact us through the contact form below. Proper bathing and showering facilities in our homes are essential amenities for safe and peaceful living. Equally as important is the ability to easily access these facilities. At certain times in life, due to an accident or illness, it may become difficult to get in and out of a traditional tub or showers—that is when it is time to consider a bathroom remodel that offers an accessible walk-in tub or roll-in shower. 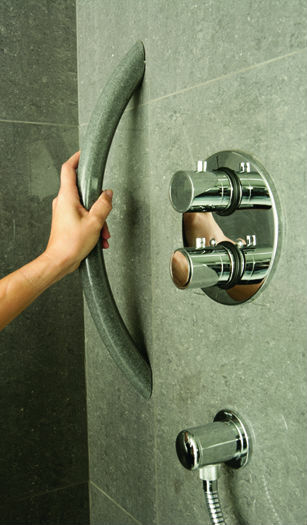 Curbless accessible showers are easier to get in and out of than the conventional shower with a curb. People with mobility challenges can more safely walk in or transfer into a barrier free shower with a wheelchair or transfer with a transfer bench to a built in seat. There are many design options available for retrofitting a bathroom to accommodate the construction of a barrier free shower. Design options include the use of a low threshold shower unit or custom made shower, creating a safe, independent and convenient alternative to a traditional bath tub. If a standard shower unit does not fit, a custom shower base, shower pan, and walls can be designed to fit your bathroom. 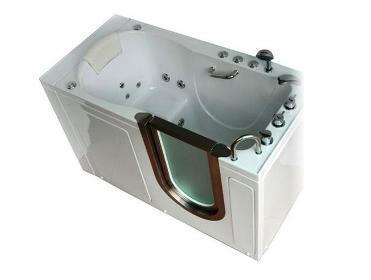 Bathtubs offering an easy, safe and pleasant bathing experience are now available with walk-in doors, along with many product options including a built-in seat, jetted spray, hydrotherapy and whirlpool systems, in-line heater, slip resistant floor and a low step for easy access. Accessible roll-in showers and walk-in bath tubs solve mobility challenges for many people with disabilities in the Atlanta area. We serve the entire Metro Atlanta area including the Georgia counties of Fulton, Gwinnett, Cobb, DeKalb, Forsyth, and Hall. For more information, contact Atlanta Home Modifications. 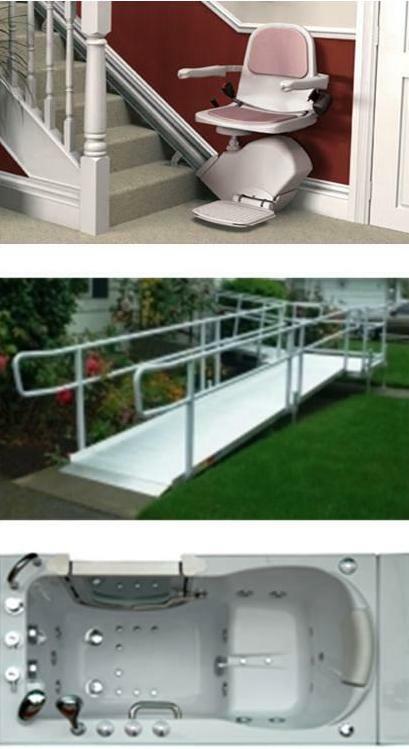 Financing options may be available, along with other accessibility and mobility equipment such as stair lifts. For additional information or an in-home assessment by a qualified accessibility bathroom design consultant, call us at 770.880.3405. Are you planning to live in your Atlanta, Lawrenceville, Dunwoody, Buckhead or Marietta home for your lifetime? The following aging-in-place and universal design principles apply to making your home accessible for today, and for tomorrow, too! Universal design principles include level access to at least one exterior door; One-story living with the dining, living room, and at least one bedroom and one bath on the main level; Wide doorways and hallways to move easily from room to room; Accessible walk-in tub or roll-in shower; Extra floor space for roominess, and wheelchair freedom; and stacked closets for future residential home elevators. 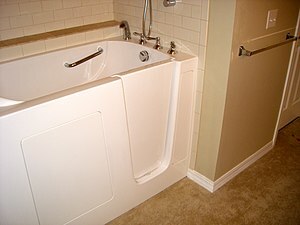 Atlanta Home Modifications, LLC has the accessibility expertise, certified-aging-in-place specialization and home modifications experience to assist you with the selection and installation of a new Ella’s Walk-In Tub for your home, EZ-Access aluminum ramps, and Bruno, Sterling and Savaria Stair Lifts. Contact the Certified Aging-In-Place Specialist at Atlanta Home Modifications, LLC for a complimentary home assessment by calling 770.880.3405, or by email at Info@AtlantaHomeMods.com . Visit the Atlanta Home Mods websitefor more information about how to apply aging-in-place accessibility design strategies to your Atlanta, Lawrenceville, Dunwoody, Buckhead or Marietta Home.